Gallium is grayish when solid, tin or silvery colored when molten. It has one of the longest liquid ranges of any metal, has a low vapor pressure even at high temperatures and show a tendency to remain in a supercool state. Gallium is one of four metals that can be molten at room temperature. It has a higher density as a liquid than as a solid. Gallium can be alloyed with most metals and is frequently used as such to reduce the melting point. 1. 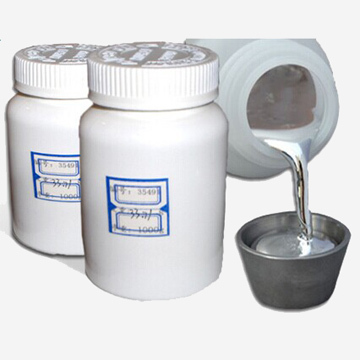 Customized gallium alloy, such as Galinstan (Gallium: Indium: Tin), Gallium copper alloy, Gallium Indium alloy, etc. 3. Wide range of application like the production of semiconductor, such as gallium arsenide, gallium phosphide, light emitting diodes (LED), germanium semiconductor doping element, high temperature weatherglass, GaInSn alloys, ultraviolet lamp, atomic energy pile.